The LONGi 300W Mono Solar Panel LR6-60PE-300M is manufactured by the Chinese LONGi. LONGi has produced photovoltaic cells since 2007 and is the world leader in photovoltaic cell production. 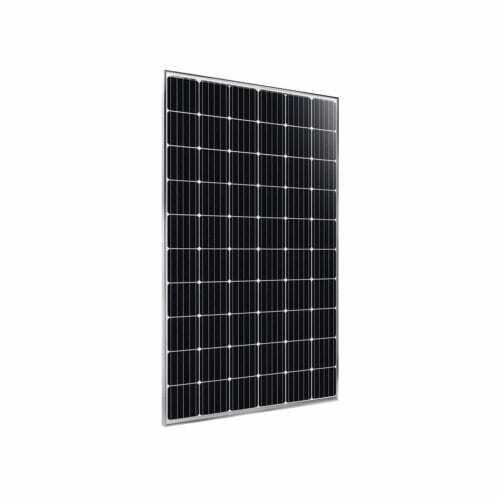 The LR6 lineup is an efficient monocrystalline 60-cell module, with excellent electrical and solid structural performance (5400 Pa snow load and 2400 Pa wind load). These modules feature black 40mm frames with white back sheets, MC4 connectors, and industry-standard -0/+5W sorting. The LONGi 300W Mono Solar Panel LR6-60PE-300M has an aesthetic appearance with black frame and white backsheet, best suited for rooftop installations. Positive power tolerance (0~ +5W) guaranteed. High module conversion efficiency (up to 19.3%). Solar power degradation enabled by Low LID Mono PERC technology: first yer <2%, 0.55% year 2-25. Solid PID resistance ensured by solar cell process optimization and careful module BOM selection. Adaptable to harsh environment: passed rigorous salt mist and ammonia tests. Robust frame (40 mm) withstands mechanical loading of 5400Pa for snow load on front and 2400Pa for wind load on rear side. LONGi is a world leading manufacturer of high-efficiency mono-crystalline solar cells and modules. LONGi has been focusing on MONO for 18 years and is the largest supplier of mono-crystalline silicon wafers in the world, with total assets above $5.23 billion(2017). It also plans to have 45 GW of monocrystalline wafer production capacity by the year 2020. Armed and powered by advanced technology and long standing experience in the field of mono-crystalline silicon, LONGi shipped approximately 4.5GW products in 2017, with over 100% rate of growth in three consecutive years. The Company has its headquarters in Xi’an and branches in Japan, Europe, North America, India, Malaysia, Australia and Africa. With strong focus on R&D, production and sales & marketing of mono-crystalline silicon products, LONGi Solar is committed to providing the better LCOE solutions as well as promoting the worldwide adoption of mono-crystalline technology. Join our ZERO Home Bills Community. BEST Products from the BEST Brands at BEST Prices for ZERO Home Bills on ZEROhomebills.com by Solaranna.